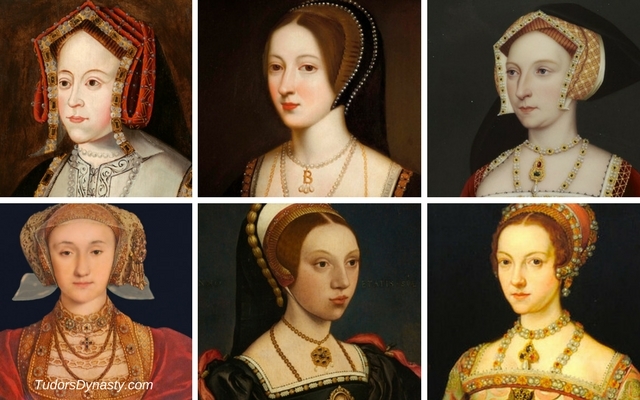 All six of Henry VIII’s queens were beautiful in their own way. Whether it was their physical beauty or their nature, there was something about each of them that the King was attracted to. 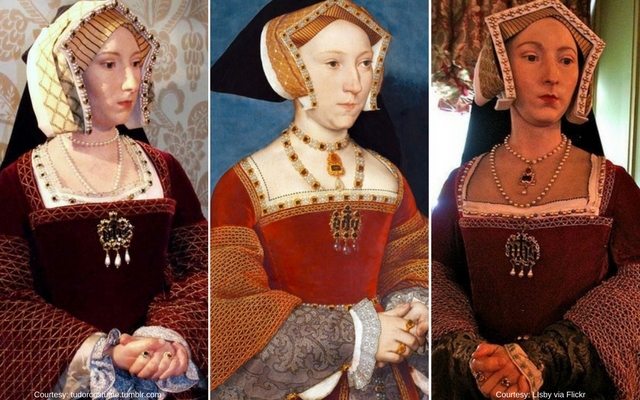 Here we take a look at some wax figures of his wives and descriptions of their appearance – we are attempting to bring the Tudor queens to life. In 1512, Henry is recorded as kissing and caressing her in public, and, according to a Spanish source, he would invite guests to admire his beautiful wife. ‘not one of the handsomest women in the world. She is of middling stature, with a swarthy complexion, long neck, wide mouth, bosom not much raised, and in fact has nothing but the King’s great appetite, and her eyes, which are black and beautiful – and take great effect on those who served the Queen when she was on the throne. 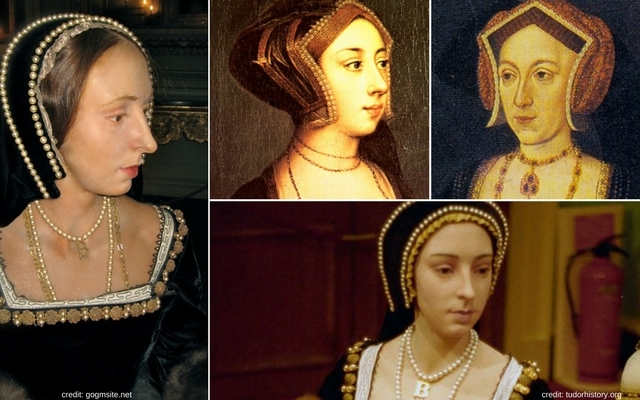 Chapuys described Jane as “of middle stature and no great beauty, so fair that one would call her rather pale than otherwise” and Alison Weir points out that “it was not Jane’s face that had attracted the King so much as the fact that she was Anne Boleyn’s opposite in every way. Jane showed herself entirely subservient to Henry’s will; where Anne had, in the King’s view, been a wanton, Jane had shown herself to be inviolably chaste. And where Anne had been ruthless, he believed Jane to be naturally compassionate. He would in years to come remember her as the fairest, the most discreet, and the most meritorious of all his wives.” Perhaps she reminded him of his mother, Elizabeth of York? To be fair to Anne, however, until Henry expressed such a strong aversion towards her, there had been no other disparaging accounts of her appearance. The famous nickname of ‘Flanders Mare’ was only coined by Bishop Gilbert Burnet in the late 17th century. Most of the contemporary accounts before her marriage had been complimentary. Even Henry was forced to admit that she was “well and semelye [seemly]”. But the fact that she nevertheless repelled him ensured that Anne would henceforth be known as the ‘ugly wife’. Other scholars cite the French ambassador Marillac’s comments that she was not of spectacular, but rather moderate, beauty, while being of a graceful disposition. Katherine, during her rise to power, was referred to by the Spanish author of ‘The Chronicle of Henry VIII’, written some years after the events, as being the most beautiful woman in the kingdom, while the French ambassador initially described her as being a young woman of ‘extraordinary’, or ‘great’, beauty. Another courtier suggested that she was very ‘beautiful’. 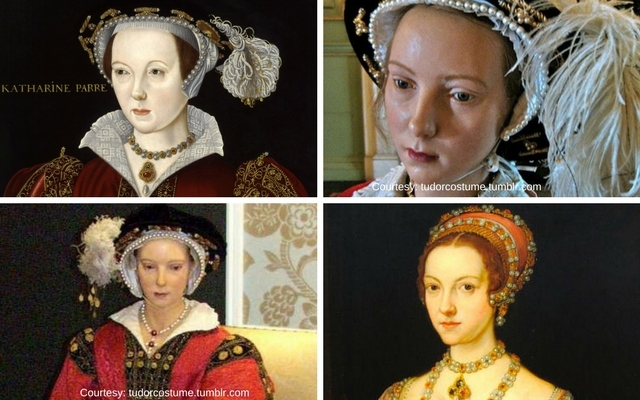 According to contemporary ideals, therefore, it seems likely that Katherine was at least fair in order to merit such descriptions, for women who were dark-haired were often perceived as being inferior in their physical appearances. 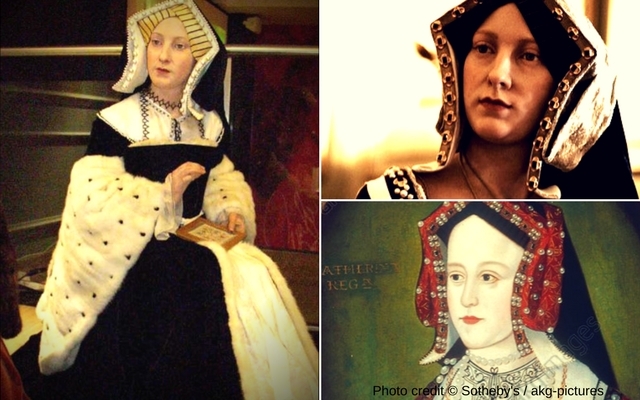 It seems reasonable to suppose that Katherine was attractive – Henry VIII was very susceptible to physical appearance, as his rejection of Anne of Cleves because he did not fancy her, shows. 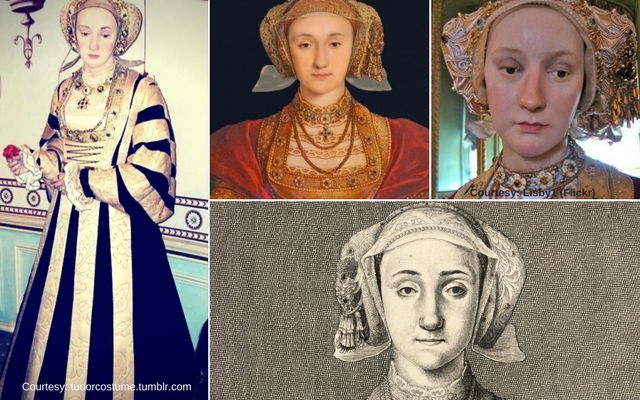 However, she is not referred to as beautiful by any of the ambassadors sending reports, and, in fact, Anne of Cleves is reputed to have complained that Katherine was less good-looking that herself. Her height has been variously described by her biographers as 5 foot 4 inches, or 5 foot 10 inches, based on the length of her coffin. The shorter height seems more likely, as 5 foot 10 inches would be exceptional for a woman at that time. Tall women, such as Marie de Guise and her daughter, Mary Queen of Scots were remarked on. 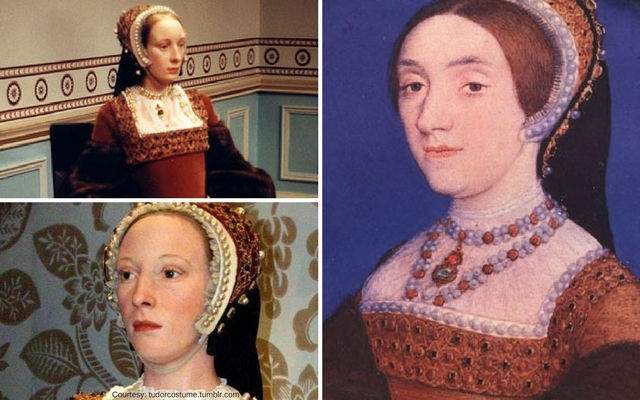 Katherine’s hair, a lock of which is preserved at Sudeley Castle appears to be of a dark blonde hue, and so far as can be told from the paintings, her eyes were hazel or brown. Is there a place where the wax figures are on display? They do look like their paintings and I would love to see an exhibit of them along with anything that was of that time or replicas of some of their clothing. If you Google Madam Tussaud’s wax figures (Henry VIII) you will find where they are. Also, in the next few days there will be a post here regarding replica gowns. Upon reading, I thought a misprint, ‘double chin’ ?